I launched my Dev and Ollie picture book series in March 2015 with the objective of introducing children to unique festivals around the world in a modern, informative and humorous manner. My mission is to help ALL children not only to be reading well, but also to be well read by helping add variety to their bookshelves and increase their understanding and appreciation of cultures outside of their own. Born in India, raised in Japan and living in the UK since 2000, I describe myself as a global citizen. My love for diverse cultural traditions began in 1995 when I spent some time in India studying Computer Science. During this time, I began exploring India extensively, gaining first-hand experience of amazing festivals, collecting memories and inspiration for my future work in children’s literature. Winner of the Asian Women of Achivement arts & culture award in 2016 in recognition for promoting inclusion. Nothing is more gratifying to me than engaging with children directly. I am now invited to schools and libraries regularly. My 3rd book Camel Caper was very well received this year in several libraries as part of the Summer Reading Challenge with the theme being Animal Agents. An introduction to the importance of understanding festivals around the world. A complimentary arts & craft activity to help consolidate the learning. With Kite Crazy, I offer kite making workshops, with Colour Carnival, children enjoy playing with colours outside in the playground and with Camel Caper, a 'camel beauty contest' where children decorate their own camels on paper, has proven to be extremely popular. 'I would thoroughly recommend inviting Shweta Aggarwal, and Dev and Ollie, into your school for a Colour Carnival. Both children and staff enjoyed themselves immensely, learning in a fun and unique way. I don't think any of us have ever experienced an author visit like it!' – Headteacher at Gunter Primary School, Birmingham. 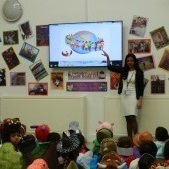 'Ruislip Gardens PS welcomed Shweta Aggarwal for an exciting day of storytelling. We looked forward to exploring a story from India and learning more about the culture and festivals celebrated there - we were not disappointed. From the youngest children in Reception to the oldest in Year 2 there was engagement with the story characters Dev and Ollie and the theme of kite flying. Adults and children enjoyed the storytelling and on returning to their classroom my Year 1 children wanted to write their own kite stories and poems based on what they had heard. All the children loved the kites that they made at the end of the session and who would think that paper and string could bring such excitement!' - Curriculum Leader at Ruislip Primary School, London. 'It was a pleasure to have Shweta Aggarwal visit our school to share her new book ‘Colour Carnival’ with the pupils. ‘Colour Carnival’ acted as a learning opportunity for our students, promoting a message of tolerance and diversity. The students were captivated by the books use of colour, wit and the simplicity of the story, allowing all children access to the cultural lessons Dev and Ollie’s stories provide - in this case the Hindu festival of colour, Holi. We thank Shweta for giving our students the opportunity to have their eyes opened to new perspectives on the world through her engaging storytelling.’ - Year 1 teacher at Royal Masonic School for Girls, Hertfordshire. 'Redbridge Museum were pleased to use Shweta for a ‘Dev and Ollie’ book reading and kite making session which linked very well to the Museum’s ‘Indian Gateway’ exhibition in October 2016. The session was busy with children of many different ages and diverse backgrounds but Shweta was excellent at delivering in a fun, engaging and professional manner. She was also very organised in her preparation and it was a pleasure to work with her.' - Library Manager at Redbridge Library and Museum, London. Dev and Ollie have just arrived in India to enjoy the amazing festival of colours, Holi. But Dev doesn't like getting mucky. Will Ollie, his magical bedtime owl, be able to change Dev's mind? Dev and Ollie - Kite Crazy! Dev's favourite birthday present is a cool new kite. But how will learn how to fly it? By going straight to the largest kite festival in the world ofcourse. Ollie, his magical bedtime owl, knows just the place. All the camels from Dev's local zoo have gone missing! Where could they be? Perhaps at a camel fair? Join Dev and his magical bedtime owl, Ollie, on their quest to find them.